Cron is a software utility that allows us to schedule tasks on Unix-like systems. The name is derived from the Greek word "Chronos", which means "time". The tasks in Cron are defined in a crontab, which is a text file containing the commands to be executed. The syntax used in a crontab is described below in this article. Python presents us with the crontab module to manage scheduled jobs via Cron. The functions available in it allow us to access Cron, create jobs, set restrictions, remove jobs, and more. In this article we will show how to use these operations from within yhour Python code. For the interested reader, the official help page can be found at https://pypi.python.org/pypi/python-crontab. * * * * * means: every minute of every hour of every day of the month for every month for every day of the week. 0 16 1,10,22 * * tells cron to run a task at 4 PM (which is the 16th hour) on the 1st, 10th and 22nd day of every month. Crontab is not included in the standard Python installation. Thus, the first thing we have to do is to install it. According to the crontab help page, there are five ways to include a job in cron. Of them, three work on Linux only, and two can also be used on Windows. There are two more syntaxes that will also work on Windows. Here, my command defines the task to be executed via the command line. In the above code we have first accessed cron via the username, and then created a job that consists of running a Python script named example1.py. In addition, we have set the task to be run every 1 minute. The write() function adds our job to cron. As we can see from the above code, the program will open and append the phrase "Accessed on" with the access date and time added. As we expected, Figure 1 shows that the file was accessed by the program. It will continue to do the assigned task while the example1.py program is running on cron. Once a new task is added, we can set restrictions for each of them. One of the main advantages of using Python's crontab module is that we can set up time restrictions without having to use cron's syntax. This will tell cron to run the program in the months of April and November. The above code will set the final schedule to run every seven hours, cancelling the previous schedule of five hours. This will set the schedule as every 15 hours, and at 3 AM. The 'every' condition can be a bit confusing at times. If we write job.hour.every(15), this will be equivalent to * */15 * * *. As we can see, the minutes have not been modified. This will set the schedule to 0 */4 * * *. Similarly for the 'day of the month', 'month' and 'day of the week' fields. As we can see in Figure 2, the program has set the second task's minutes to zero, and defined the first task minutes' to its default value. As we can see in Figure 3, the schedule has changed from every 5 minutes to the default setting. 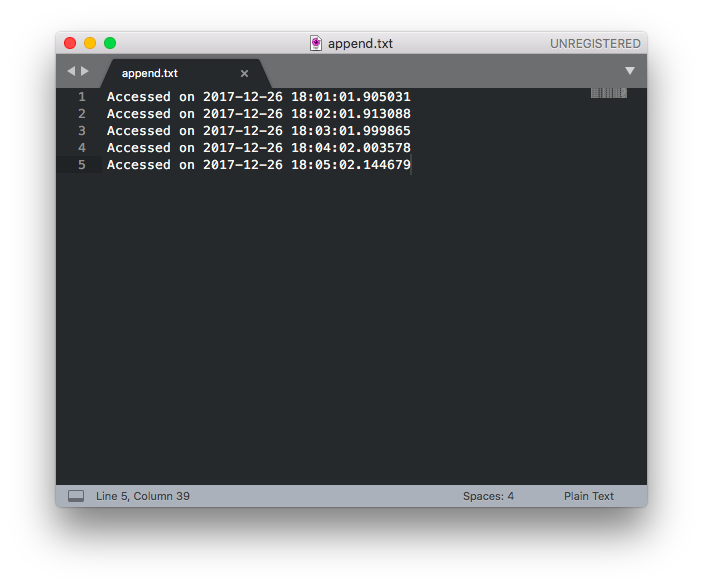 The Python crontab module also allows us to search for tasks based on a selection criterion, which can be based on a command, a comment, or a scheduled time. The syntaxes are different for each case. Here 'command name' can be a sub-match or a regular expression. As you can see, it correctly finds the cron command each time. The following code shows how to remove a task that was previously created. The program first creates the task. Then, it lists all tasks, showing the one just created. After this, it removes the task, and shows the resulting empty list. This will remove all jobs where comment='my comment'. The following example will remove all cron jobs and show an empty list. In addition, Cron-level environment variables are stored in 'cron.env'. The Python module crontab provides us with a handy tool to programmatically manage our cron application, which is available to Unix-like systems. By using it, instead of having to rely on creating crontabs, we can use Python code to manage frequent tasks. The module is quite complete. Although there have been some criticisms about its behavior, it contains functions to connect to cron, create scheduled tasks, and manage them. As shown in the above examples, their use is quite direct. Thus, it provides a tool that allows for complex scripts with the main Python characteristic: simplicity.